The Relentless Ceilidh Band blurs the line between traditional and contemporary dance music. They create music with an unmatched driving force that builds to outrageous peaks giving them the title ‘Relentless’. At the band’s centre are the virtuosic 3-time Folk award nominee Will Pound (Melodeon/Harmonicas) and energetic twin fiddles of Rosie Butler-Hall and Manny Grimsley. They have honed their skills through extensive late night sessionning and playing for many of the country’s favourite dance teams. The rhythm section boasts Dan Bones (Guitar/bass) and Nick Haynes (Cajon) whose broad experience allows for trance-like build up and a glorious full sound using only traditional instruments. 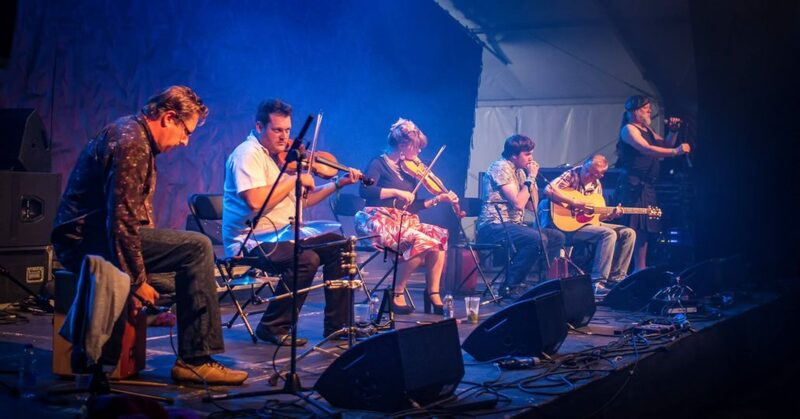 The Relentless ceilidh band will leave audiences breathless and fill the dance floor to brimming.